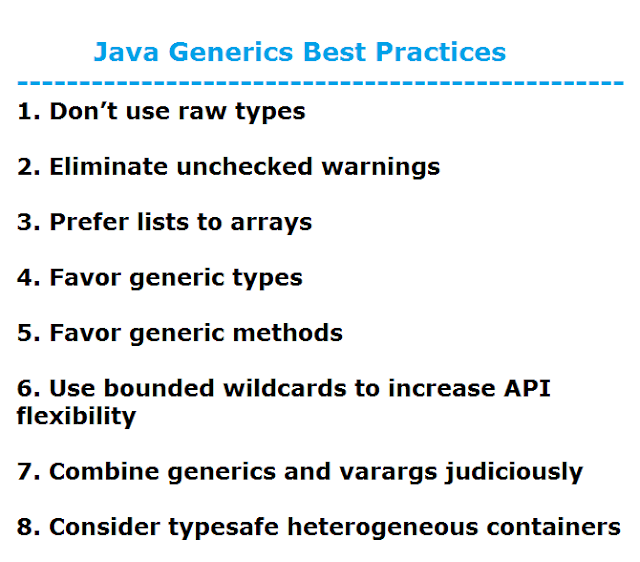 In this article, we will discuss what are Java generics best practices we should follow. I referred to these best practices from Effective Java book. Thanks to Joshua Bloch (Author of Effective Java) providing such great best practices and tips to enhance our knowledge. As we know that from Java 5, generics have been a part of the Java language. Before generics, you had to cast every object you read from a collection. If someone accidentally inserted an object of the wrong type, casts could fail at runtime. With generics, you tell the compiler what types of objects are permitted in each collection. The compiler inserts cast for you automatically and tell you at compile time if you try to insert an object of the wrong type. This results in programs that are both safer and clearer, but these benefits, which are not limited to collections, come at a price. This article tells you how to maximize the benefits and minimize the complications. 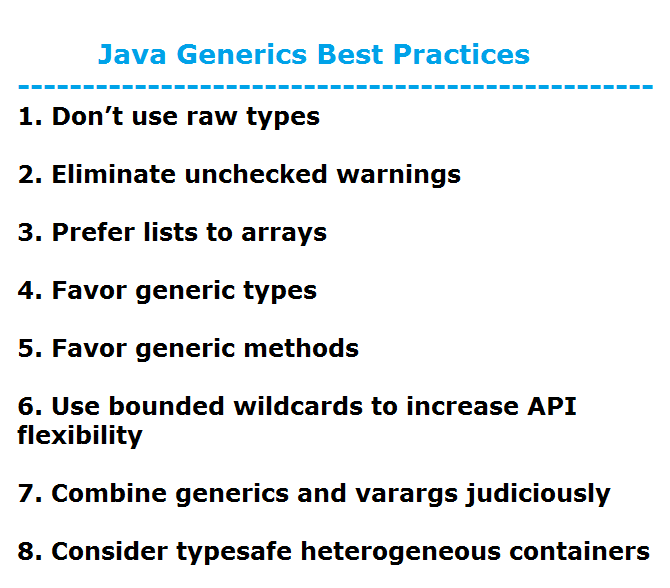 If you are new to Java generics then read our recommended Java Generics Tutorial. Let's discuss each above generics best practices with explanation and examples. A raw type is the name of a generic class or an interface without any type arguments. Using raw types can lead to exceptions at runtime, so don’t use them. They are provided only for compatibility and interoperability with legacy code that predates the introduction of generics. This program demonstrates why not to use raw types and what is a problem by using raw type. Please refer to the comments are self-descriptive. // Example Raw Collection Type - Don't do this! // If you accidentally put a coin into this stamp collection, the insert will comile and run without error. Read more about Raw types on Oracle Java Tutorial. Eliminate every unchecked warning that you can. If you eliminate all warnings, you are assured that the code is TYPESAFE. Means you won't get ClassCastException at runtime. If you can't eliminate a warning and you can prove that the code that provoked the warning is typesafe, then (and only then) suppress the warning with an @SupressWarnings("unchecked") annotation. Highly recommended to use SupressWarnings annotation on smallest scope possible. Every time you use a @SuppressWarnings("unchecked") annotation, add a comment saying why it is safe to do so.This will help others understand the code, and more importantly, it will decrease the odds that someone will modify the code so as to make the computation unsafe. Let's look at few @SuppressWarnings() annotation examples. If the above code is compiled without @SuppressWarnings("unchecked") annotation, the compiler will complain like this: XYZ.java uses unchecked or unsafe operations. Unchecked warnings are important. Don’t ignore them. Every unchecked warning represents the potential for a ClassCastException at runtime. Do your best to eliminate these warnings. If you can’t eliminate an unchecked warning and you can prove that the code that provoked it is typesafe, suppress the warning with a @SuppressWarnings("unchecked") annotation in the narrowest possible scope. Arrays and generics have very different type rules. Arrays are covariant and reified; generics are invariant and erased. As a consequence, arrays provide runtime type safety but not compile-time type safety, and vice versa for generics. As a rule, arrays and generics don’t mix well. If you find yourself mixing them and getting compile-time errors or warnings, your first impulse should be to replace the arrays with lists. This example demonstrates why generic array creation is illegal. Please refer the comments are self-descriptive. Let's understand how to create with and without generic stack implementation. Consider the following simple stack implementation. * If num of elements used is equal to the length of the array, make a new one with greater capacity. Let's parameterize above non-generic stack implementation with generic. Replace all the uses of the type Object with the appropriate type parameter. Generic types are safer and easier to use than types that require casts in client code. When you design new types, make sure that they can be used without such casts. This will often mean making the types generic. If you have any existing types that should be generic but aren’t, generify them. This will make life easier for new users of these types without breaking existing clients. Let's learn how to create Generic Types in my separate article Java Generic Types with Example. In previous best practices, we saw how to create generic types so now we will see how to create generic methods and it's usage. Static utility methods that operate on parameterized types are usually generic. All of the “algorithm” methods in Collections (such as binary search and sort) are generic. Above method is a deficient method, to fix these warnings and make the method typesafe, modify its declaration to declare a type parameter representing the element type for the three sets (the two arguments and the return value) and use this type parameter throughout the method. Let's learn how to create generic methods in my separate article How to Create Generic Methods with Examples? Parameterized types are invariant. List is neither subtype nor a supertype of List. There's a special kind of parameterized type called a BOUNDED WILDCARD TYPE. Iterable of some subtype of E' can be written as Iterable<? extends E> - Upper bounded wildcards. Collection of some supertype of E' can be written as Collection<? super E> - Lower bounded wildcards. // pushAll with wildcard type - good! varargs and generics do not interact well because the varargs facility is a leaky abstraction built atop arrays, and arrays have a different type of rules from generics. Though generic varargs parameters are not typesafe, they are legal. If you choose to write a method with a generic (or parameterized) varargs parameter, first ensure that the method is typesafe, and then annotate it with @SafeVarargs so it is not unpleasant to use. The rule for deciding when to use the SafeVarargs annotation is simple: Use @SafeVarargs on every method with a varargs parameter of a generic or parameterized type, so its users won’t be burdened by needless and confusing compiler warnings. This implies that you should never write unsafe varargs methods like dangerous or toArray. The normal use of generics, exemplified by the collections APIs, restricts you to a fixed number of type parameters per container. You can get around this restriction by placing the type parameter on the key rather than the container. You can use Class objects as keys for such typesafe heterogeneous containers. A Class object used in this fashion is called a type token. You can also use a custom key type. For example, you could have a DatabaseRow type representing a database row (the container), and a generic type Column as its key. Please comment if you have any suggestions or feedback about this article would be appreciated. Happy learning and keep coding !! !